Colosseum is the most famous landmark in the Rome and in Italy. It is also known as the Flavian Amphitheater (Amphitheatrum Flavium). It is the most famous monument of ancient Rome, one of the grandest and best preserved buildings of the ancient world. More than 4 million people visit the Colosseum each year (4.6 million visitors in 2009). 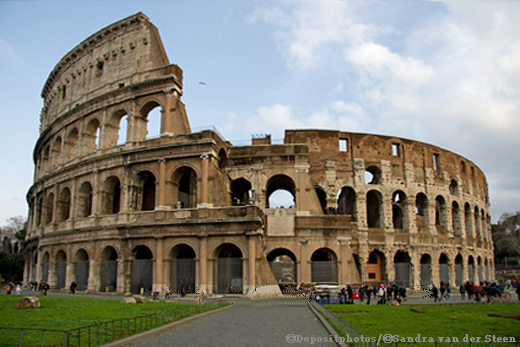 According to statistics, more than 90% of coming to Rome tourists visit the Colosseum. Coliseum word (from the Latin colosseus) means a huge, very large. Colosseum amphitheater has an ellipse shape. Amphitheater dimensions: the maximum length (long axis) - 187.77 m, minor axis - 155.64 meters, the length of the arena 85.75 meters, arena width 53.62 m, wall height up to 48.5 meters. The Colosseum was built between 72 and 80 years. It was used for a variety of dimensions for the citizens of Rome. It was not only gladiatorial combats. There were also chariot races, fights with wild animals, played military battle. Sometimes it was a grand event. It is believed that the Emperor Trajan celebrated his victory in Dacia during the 123 days. In the battles were involved 11,000 animals and 10,000 gladiators. Last gladiatorial combat in the Colosseum was held in 404. After the spread of Christianity, gladiator fights were banned. The amphitheater is located in the historic center of the city, between the Esquiline, Palatine and Caelian hills. “Colosseo” metro station is located nearby. Near the Coliseum, there are also Triumphal Arch of Constantine and the Roman Forum. The cost of a single ticket to the Colosseum, Roman Forum and Palatine Hill (COLOSSEO, Foro Romano and Palatino) is €12,00 (2013). You can purchase admission tickets to Vatican museum online. See the “Colosseum” location on a map of Rome.